If you grew up in a faith culture that doesn't include rituals, the season leading up to Easter may be filled with confusing terms. Lent? Ash Wednesday? Maundy Thursday? What do they all mean, and why are they important for contemporary women who love Jesus? I understand the confusion, because I also grew up in a church that didn't celebrate rituals or ceremonies. But when I attended an evangelical university, I was surrounded by friends who were all giving up something for Lent. Sugar. Facebook. The Bachelor. All of a sudden, fasting for Lent became a right of passage for those of us who grew up in conservative evangelical churches. So I joined in. I gave up sugar my first year of Lent. I'm not quite sure what I expected from experience — perhaps some renewed spiritual vigor or a deeper understanding of God, but the end result was simply that I lost 5 pounds. No spiritual breakthroughs, no closer walk with Jesus: just an indifference to chocolate covered donuts (that lasted a whole 2 days after Easter). And while temporarily overcoming my sweet tooth was an accomplishment, I felt like I totally missed the point of Lent. Surely there's got to be a better reason for millions of people going through this season of preparation. The next year for Lent, I paired my fasting with prayer, and I was surprised at the difference that made. I can't remember what I gave up at year, but the important part isn't what I gave up, but rather what I gained. 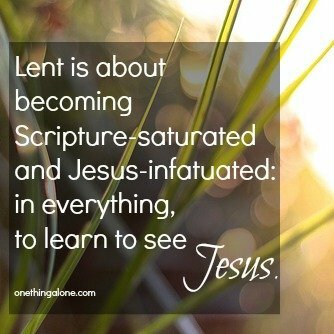 I came to understand Lent as a season to become Scripture‐​saturated and Jesus‐​infatuated: in everything, to learn to see Jesus. That year, Easter Sunday took on a whole new meaning, and it was the grandest celebration ever, maybe not for the other people sitting in the auditorium, but definitely for me. I came to realize that Lent isn't so much about the discipline of fasting or about giving something up, or even about identifying with the suffering of Jesus, because let's face it: temporarily craving an ice cream sundae brownie doesn't even come close to the suffering our Lord endured for our salvation. It's so much more. Lent is meant to bring us face‐​to‐​face with our sinfulness and our weakness, and bring us to our knees and recognition that we need Savior, even after all these years of being a good church girl. My prayer is that we'll learn to see and savor Jesus Christ in the little things this season leading up to Easter, and that our walks with God would become just that: a constant motion forward, thanking Him and others throughout our day instead of just a few moments every morning. And whether we call it Lent or we call it something else, whether it's 40 days or 10 days, whether it's getting up a single pleasure or following a rigid fasting calendar — that part really doesn't matter. Because in the end, it's not about crossing something all off our spiritual to do list; it's about drawing close to God, and He will draw close to us (James 4:8). So this year, whether or not you're doing Lent, let me encourage you to set aside time to seek God, whatever that looks like for you. Today… this week… this season, set aside time to seek God.